Inflorescence of another large terrestrial bromeliad in the genus Bromelia. 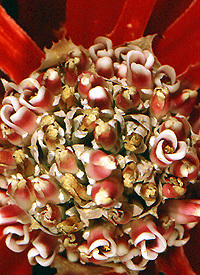 The leaves of the rosette that are closest to the inflorescence are red in this photograph. Many bromeliads produce red or other colored leaves or bracts when they flower.